The Map of Old Cape Cod The Land of Bold explorers Heroic Pilgrims Hardy seamen Great fisheries and Famous ships. This is a beautiful example of the 1930 pictorial map of Cape Cod, Massachusetts drawn by artist Frederick Coulton Waugh. It covers all of Cape Cod as well as part of the adjacent South Shore including Plymouth, Buzzard Bay, and Duxbury. The map beautifully illustrates and notes important towns and roads in addition to offering a wealth of vignettes alluding to the regions nautical heritage. These include 'The old map of the sea,' the horrible sea serpent' etc. Various ship wrecks and historical events are also noted, including the arrival of the Mayflower. The top and bottom borders include illustrations of ships, lighthouses and buildings, while the left and right borders include illustrations of famous ships and sea shells. Coulton Waugh was the son of noted marine painter Frederick Waugh. The two Waughs differed artistically, yet they shared a love of the sea and were on the best of terms personally. Coulton was a professional sailor and made scale drawings of historic ships, designed fabrics, and made decorative maps and charts…Coulton Waugh was considered to have revived, if not originated the art of decorative map making when he exhibited a large map of silk in 1918 at the International Silk Show in New York City. His map of Cape Cod is one of the most decorative ever prepared. The central cartouche shows the Mayflower and two Pilgrims in armor. The border was reproduced from a drawing cut with a knife in the wood-block technique. The top and bottom borders are of a stylized Cape Cod landscape and the sides borders are decorated with the images of six famous ships. The Rose Dorothea appears in the lower right hand corner. This map is considered a 'figurative map' or a 'decorative map,' and reflects a style that first began to appear around 1910. As a map, its intention is not so much to provide direction as to illustrate the character, famous places, and historical appeal of Cape Cod. Cartographically speaking, this map style most likely draws its inspiration from late 19th century 'tourist maps' and 'railroad maps.' Tourist Maps, common to major cities in Europe (usually Paris or London), included profiles of notable buildings and monuments and were designed to help foreign tourists identify and navigate to the most important sights. 'Railroad Maps' are a related genre more common to the United States. During the latter part of the 19th century railroad boom, railroad companies began issuing decorative route maps extolling the virtues various regions and their accessibility by rail. Standing somewhere between this two map styles, our map combines the decorative aspects of both while reducing cartographic value. 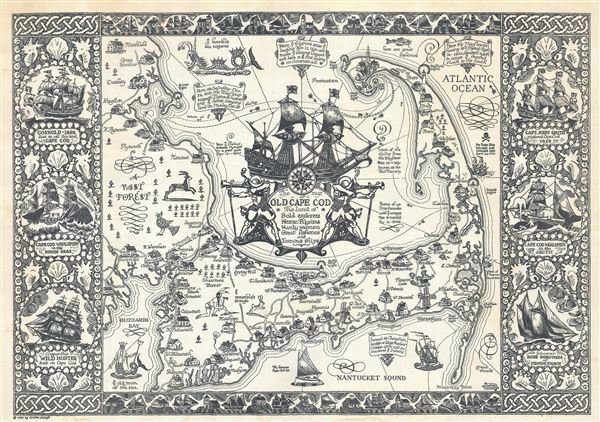 It may be hard to get from A to B using this map, but its attractive design and decorative flourishes, make it an excellent souvenir and memento of a wonderful Cape Cod vacation. Very good. Minor rip and verso repair near top left border. Minor water stains in bottom margin. Blank on verso.